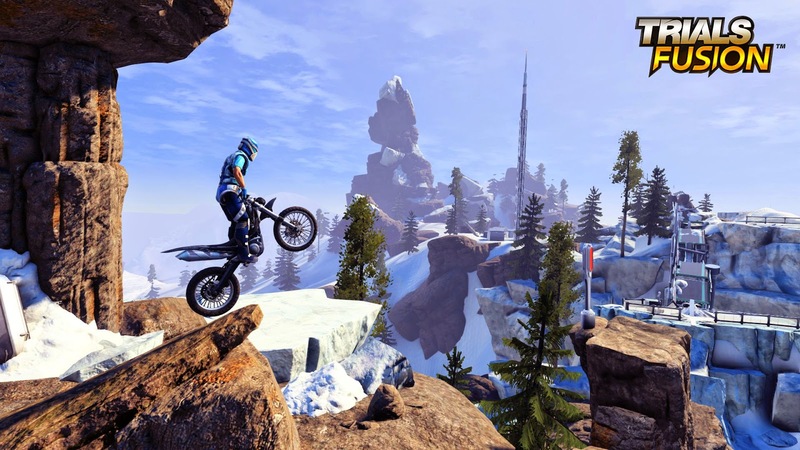 The first thing you'll notice about Trials Fusion is the setting. The world is a gorgeous, sleek imagining of the future. The structures are gigantic, with neon lights, moving platforms, futuristic drones and lots of solar panels. It's reminiscent of the Citadel, from the Mass Effect series. It's an idealistic version of the future that we all want to see. Graphically, it's really impressive. Even running on what is now a last-gen console, the visuals are sharp, and the game runs so smoothly. There are some fairly common visual glitches when restarting at checkpoints, such as textures not loading properly (or at all in some cases). But other than that, it's a gorgeous treat for the eyes. The gameplay is exactly what you would expect from a Trials game. They can't really alter it too much without upsetting a lot of loyal fans, so it's definitely a positive point. The physics are spot on, and the handling is so precise, moreso than in any other game. Possibly the best new addition is the FMX trick system. You can use the right analogue stick when airborne to throw your rider into one of many tricks. It definitely takes some getting used to, like when you stop the trick, the momentum of the rider as he sits back down will flip the bike, meaning your control has to be on top form. As well as a selection of bikes, there is also a brand new quad bike. The handling is obviously different, mainly due to the fact that it's a four-wheel drive vehicle. The added traction from the front of the vehicle means that the quad drives much differently than the rear-wheel bikes, and it's a whole new learning curve. But it's so much fun, and has a lot of power. This game also introduces a levelling system. Performing well and earning medals will help you level up faster, and doing so unlocks new items for your rider and his bikes. There are less clothing options than in Trials Evolution, but the selection is definitely better, and much less expensive. For the bikes, you can unlock and buy different body kits and wheels, but unfortunately there are none of these options for the quad and the BMX. You can change the colour of your bikes, but again, they're less customisable than they were in Evolution. The selection of tracks seems a little smaller than the two previous games, but they're perfectly crafted by the talented and experienced team at RedLynx. There's a great mix of fast and technical tracks, which give you a chance to hone your skills for every situation. Soon enough, the number of tracks in the base game will be far outnumbered by player-made tracks, so the fact that there are less tracks isn't really a big deal. Plus, RedLynx have planned a years worth of new content, totalling in six new packs. Each track has three challenges to complete, some of which are straight forward, such as finishing the track with no faults without leaning, but some are incredibly tough. These can require you to find and hit secret switches, find alternate paths through a level, and a particularly challenging one which needs you to activate a hidden afterburner and fly through a series of rings to a secret area. They're so varied in both content and difficulty, that they'll keep you busy for a long time. 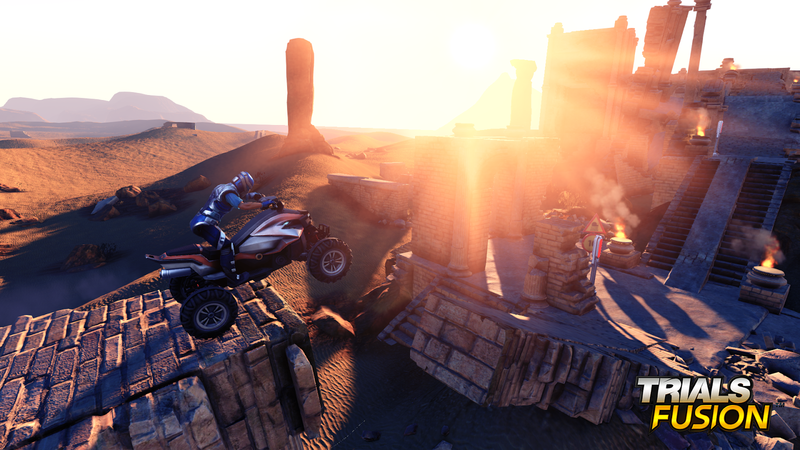 Trials Fusion is the first console game in the series to have a sort of story. When you start the game, an AI called Cindy walks you through the basics to set you on your way, but soon enough she starts talking more and more candidly, and through her you find out a bit more about the world you're in, and she eventually reveals a few secrets. It's fairly inconsequential, but it's great to have something to listen to whilst you're trying to master the tracks. If you're playing a particularly hard level and have to keep restarting though, you have to listen to the same sound clips over and over again, and it can become very annoying. Overall, Trials Fusion is definitely a worthy addition to the series. RedLynx have managed to introduce enough new elements to keep the game feeling fresh, despite the fact that the gameplay is basically identical to the last two games. The only thing is, it doesn't feel like a huge leap forward, like Evolution did. That's not to say that it doesn't nail what it sets out to, but perhaps the series has hit it's peak now. It doesn't seem like there's much else RedLynx can do with this series without it becoming too familiar, so maybe once the six planned DLC packs have released, it'll be time for them to retire the Trials franchise, at least for a little while. In the mean time though, buy Trials Fusion, and play the hell out of it. You will not be disappointed! Just don't expect the same level of improvement that Evolution had over Trials HD. Hi,I truly enjoyed playing through this game,I discovered it a great sense of achievement when step up once finishing a frustrating map.I like the part of customization of character as well.This abandons me continually changing the outfit of my rider.Playing through multiplayer maps is great, however not all maps are stunning,the prevalent ones demonstrate a challenge.Have a great time!